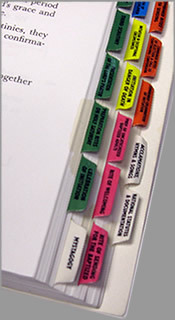 Much like tabs for your Bible, these tabs have been specifically designed for the United States edition of the R.C.I.A. ritual book - whether your copy of the R.C.I.A. is published by Liturgy Training Publications, Liturgical Press, or Catholic Book Publishing Company. This multicolor tabs (each color is for a different part of the R.C.I.A.) allow you to quickly find what you need when you need it without having to constantly rely upon the table of contents. We recommend purchasing a set of tabs for each member of your parish R.C.I.A. team. You wouldn't believe how much time and energy you will save in the long run with something as simple as a set of reference tabs for your ritual book!